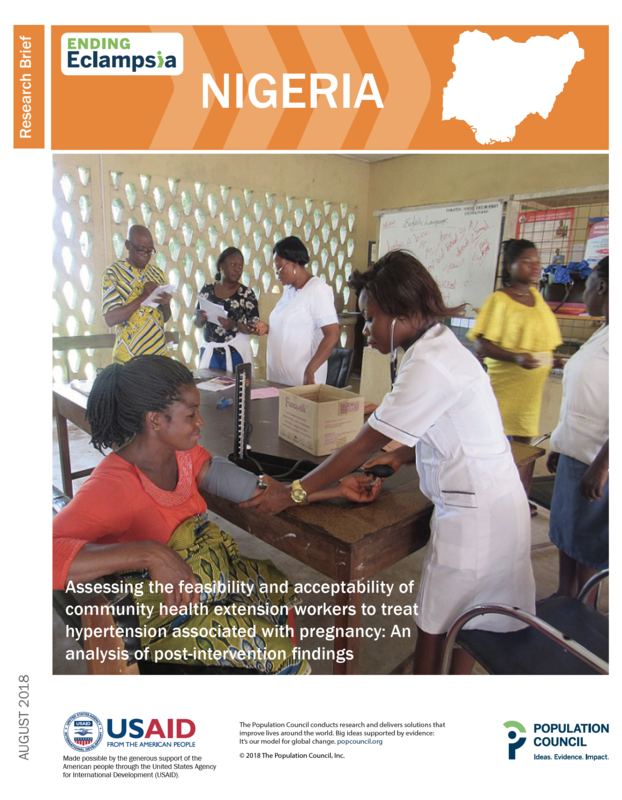 The Ending Eclampsia project aimed to understand the potential of underutilized and promising interventions that increase access to services, particularly improving community referral systems. 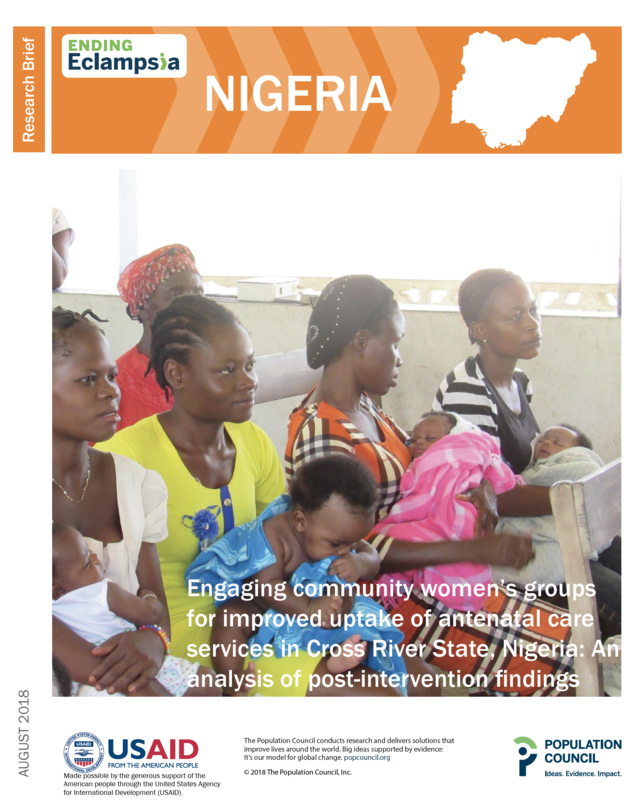 In Nigeria’s Cross River State, this study tested the feasibility of women’s group leaders delivering health information for PE/E, referral, and other antenatal care (ANC) services to their peers, to increasing access to quality maternal and newborn health services. 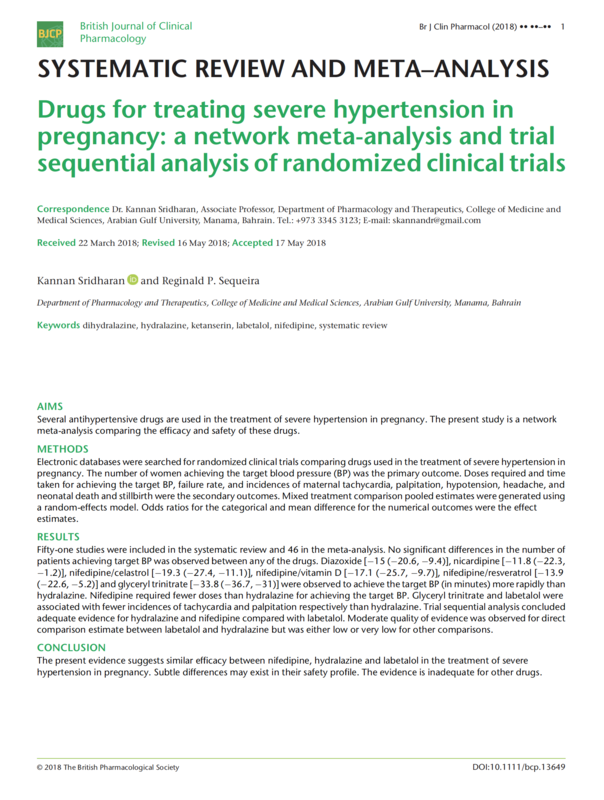 This study tested the feasibility of tasking community health extension workers (CHEWs) with detecting and managing hypertension, and prescribing an oral antihypertensive drug – alpha methyldopa (aldomet) – at primary health care (PHC) facilities as part of a package of care for women with pre-eclampsia/eclampsia (PE/E). This evaluation measured improvements in knowledge retention and increases in early detection, prevention, and management of PE/E. 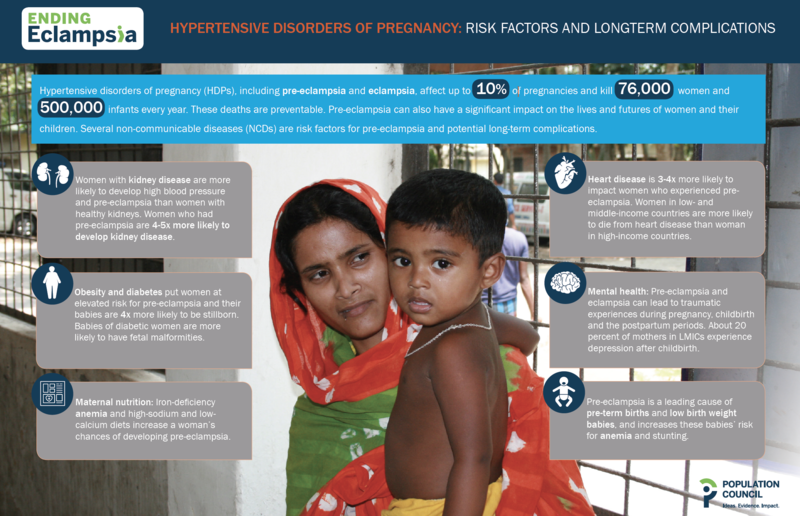 Hypertensive disorders of pregnancy (HDPs), including pre-eclampsia and eclampsia, affect up to 10% of pregnancies and kill 76,000 women and 500,000 infants every year. These deaths are preventable. Pre-eclampsia can also have a significant impact on the lives and futures of women and their children. Several non-communicable diseases (NCDs) are risk factors for pre-eclampsia and potential long-term complications. 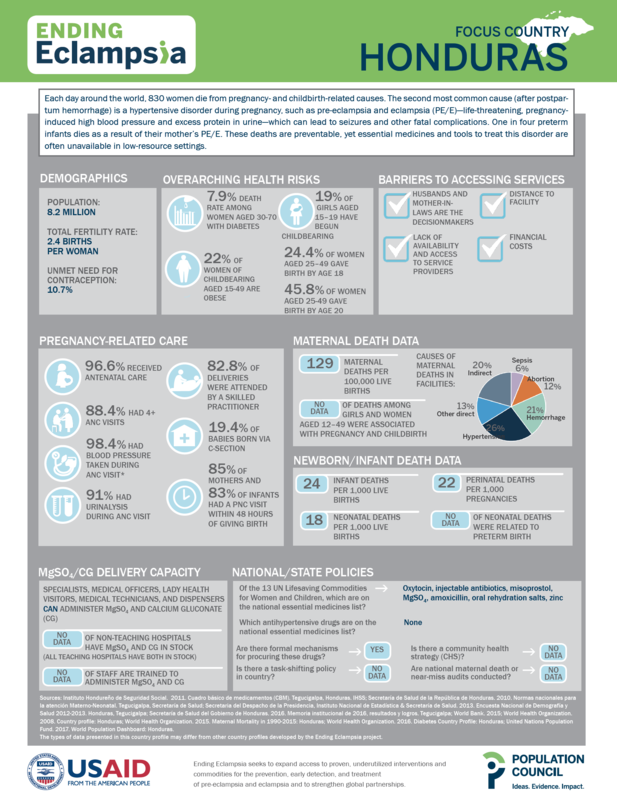 This infographic provides data on risk factors, policies, health system capacity and community perceptions in Honduras that impact health-seeking behaviors during pregnancy, specifically related to pre-eclampsia and eclampsia. Several antihypertensive drugs are used for treating hypertension in pregnancy. This study is a network meta-analysis that compared the efficacy and safety of these drugs. Pre-eclampsia is a pregnancy-specific hypertensive disorder that usually occurs after 20 weeks of gestation. It is one of the leading causes of maternal and perinatal morbidity and mortality worldwide. In Ethiopia, major direct obstetric complications, including pre-eclampsia/eclampsia (PE/E) account for 85% of the maternal deaths. Unlike deaths due to other direct causes, PE/E-related deaths appear to be increasing and linked to multiple factors, making prevention of the disease a continuous challenge. 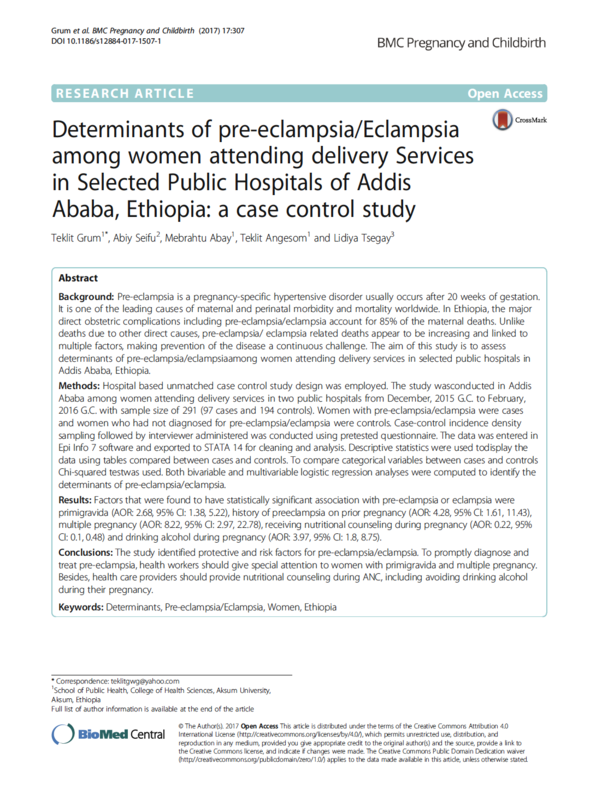 The aim of this study was to assess determinants of PE/E among women attending delivery services in selected public hospitals in Addis Ababa, Ethiopia. 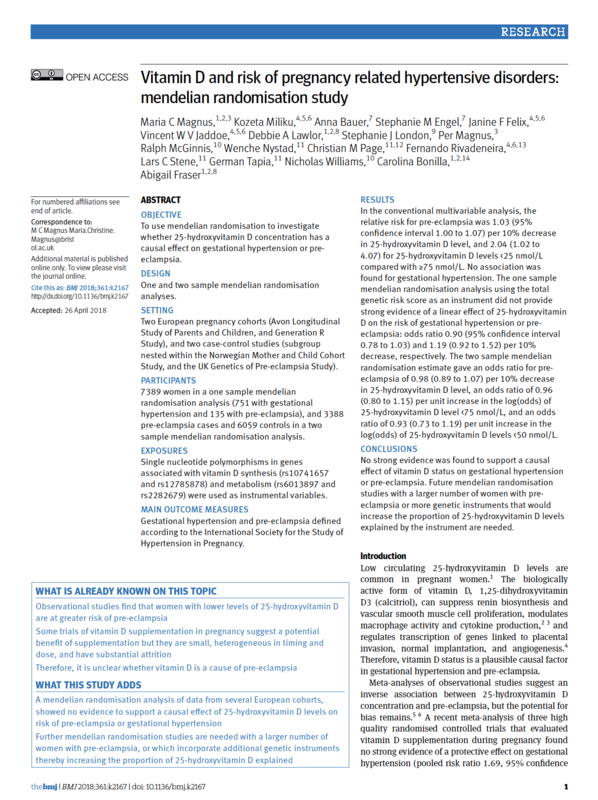 This study investigated the causal effect of 25-hydroxyvitamin D level on pregnancy-related hypertensive disorders using genetic variants associated with 25-hydroxyvitamin D levels as instrumental variables in a mendelian randomization analysis. 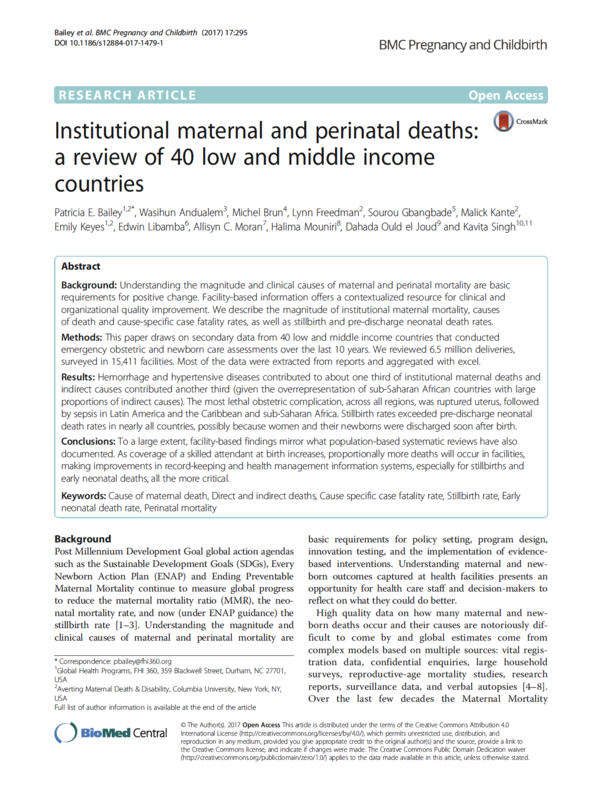 This paper summarizes data from 40 low- and middle-income countries and describes the magnitude of institutional maternal mortality, causes of maternal death and cause-specific case fatality rates, as well as institutional stillbirth and early or pre-discharge neonatal death rates, in most cases, at the national level. The analysis draws on reports produced over the last decade. 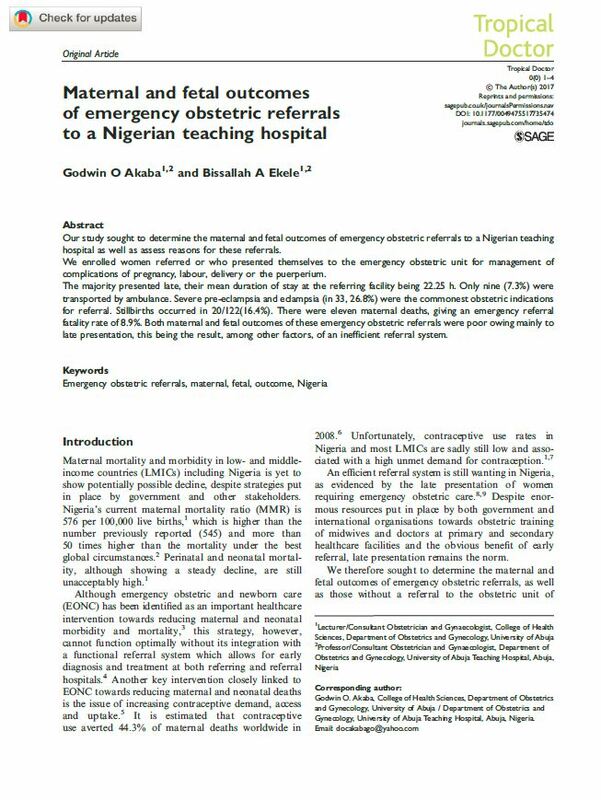 This study aimed to determine the maternal and fetal outcomes of emergency obstetric referrals to a Nigerian teaching hospital and assess reasons for these referral. Researchers also followed women in the course of their illnesses to assess patterns of morbidity. 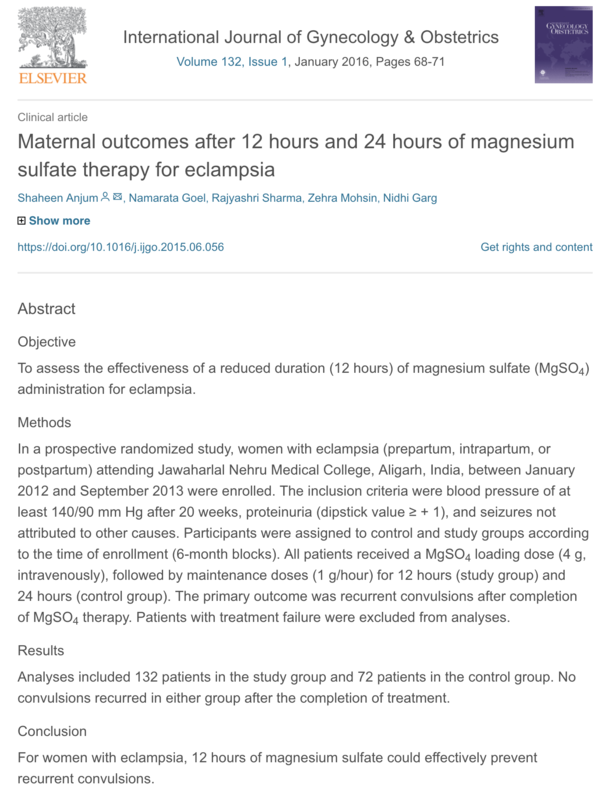 In this prospective randomized study, researchers assessed the effectiveness of a reduced duration (12 hours) of magnesium sulfate (MgSO4) administration for eclampsia at Jawaharlal Nehru Medical College, Aligarh, India.